Like last week, this week sees a bit of a shift in the status quo thanks to one Choicest Games contributor still in the process of moving house (and still without Internet unfortunately) - I've also played quite a bit of Mass Effect: Andromeda this week which is, of course, an Origin game and won't be included as part of Steam Games Sunday. This week, we once again have Rainbow Six Siege in the #1 spot but instead of having Total War: Warhammer in the #2 spot (it's dropped down to #3), we have Sid Meier's Civilization VI in 2nd place (thanks to a couple of multiplayer games we started during this week - will we ever finish this games? Probably not :P). War Thunder drops down one place to 4th position and League of Mermaids skyrockets up a few places from 9th place last week to 5th place this week. Marvel Heroes holds the line in 6th place and Everyday Genius SquareLogic has dropped down a couple of places from 5th place last week to 7th place this week. Double Fine Adventure holds steady in 8th place and an old favourite Gems of War manages to just scrape in at 10th place. The newcomer for this week happens to be Thimbleweed Park which was released just before this weekend. It's a retro point 'n' click adventure, which you'll probably say is not uncommon on the indie scene and you'd be right. 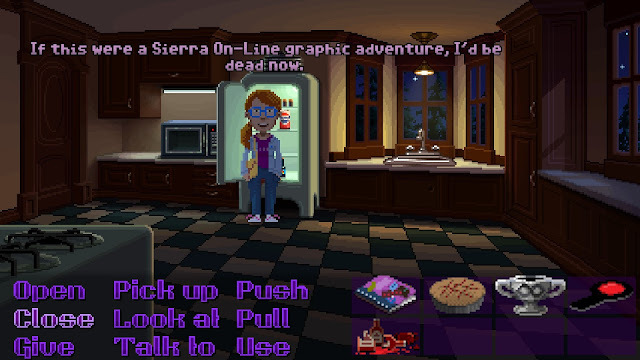 What makes this game stand out however is that it's by the guys that were pioneers of the point 'n' click adventure industry, making them back in the 1980s and 1990s: Ron Gilbert and Gary Winnick, who worked on many early Lucasarts adventures! So far, I'm having a blast with it and the game is scoring very highly on Steam so far at 98% positive reviews!